BMW has showcased the Z4 Sports Car Concept at the ongoing Frankfurt Motor Show. Painted in matte copper color, the car with long hood, short rear deck, compact size and short overhangs looks stunning in design. Other than this, the featured large air intakes and nostrils define the DNA of a sports car. Based on the CLAR architecture with lightweight chassis, the Z4 concept is claimed to draw design element from the older cars, eg. the Mille Miglia-winning roadster, the BMW 328. The propelling of the car is based on the all-rear wheel drive system. While, inside the cabin, the concept was equipped with next generation three-spoke steering wheel and large red paddle shifters. 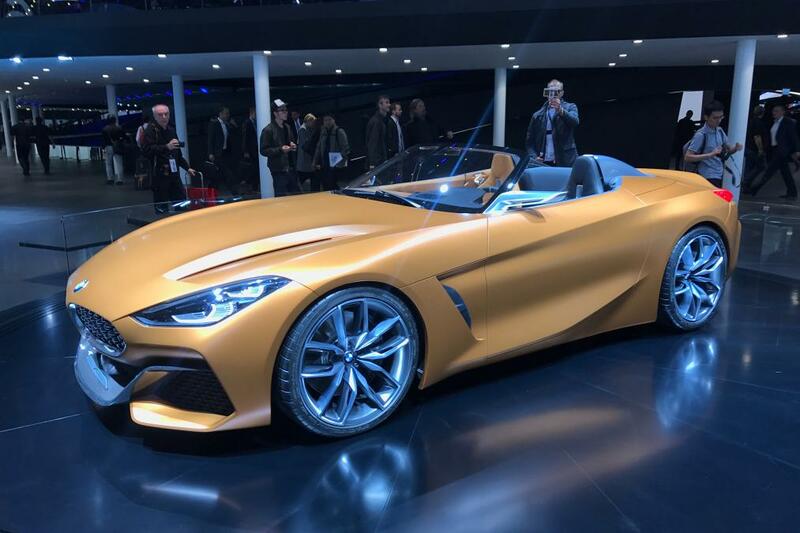 It is believed that the concept BMW Z4 will be a joint effort of BMW and Toyota. Other than this, a long awaited sports car from Toyota expected to be a successor of Supra, will underpin the same above mentioned platform. A coupe version for the Japanese auto major is also under rumors from the BMW and Toyota alliance, that is likely to unveil later this year. In this partnership, the cars projects will share BMW’s engines and will be manufactured at the same Magna factory in Graz, Austria.